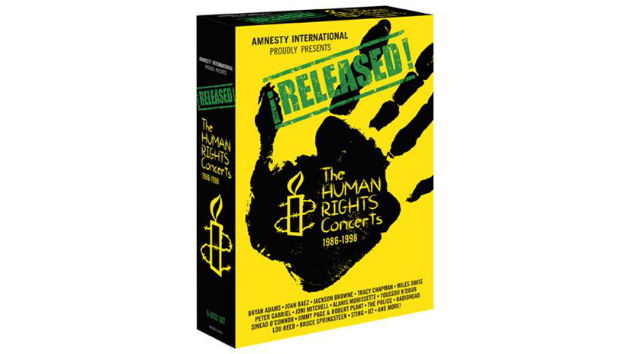 Plowing through over 16 hours of music, documentary footage, interviews, home movies, videos and background information in this mammoth 6 DVD set (also available as a slimmed down double CD) of Amnesty International concerts from the titular years, it becomes difficult to separate the box’s substantial historical importance from its artistic qualities. Anything that brings more attention to this long standing human rights organization, that serves in part to release political prisoners, is a worthwhile endeavor. This lavish, sprawling long awaited release with its 14 hours of previously unreleased material will certainly accomplish that. But on a purely visceral level, how often you’ll actually play the thing, even to cherry pick some of its best moments, is another question. The six discs adequately cover highlights of the 1986, 1988 and 1990 concerts held in various parts of the world, with some later clips to carry us through to 1998 and beyond. Many of the usual suspects such as Jackson Browne, Peter Gabriel, Sting, Tracy Chapman and Bruce Springsteen are here multiple times and their sets range from pretty good to pretty great. The opening 1986 show from Giant’s Stadium in New Jersey—which accounts for 5 ½ hours of playing time– is symptomatic of some of the problematic issues. The show was originally recorded on videotape and even with current technological enhancements, both video and audio still sound like you’re watching VHS quality reproduction. The performances and some of the bands are not surprisingly dated (the Hooters, anyone?) which will tax even the most patient viewer. Thankfully the recording quality improves as the years wear on, as do the hairstyles, clothing and camera work. Also, when playing to crowds this large, the performers tend to reach for the back row which, unless you are U2 or Springsteen, often doesn’t do justice to music that loses nuance in this setting. Some tunes are extended way past their breaking point, which might have made for an intense show, but can get tiresome in your living room. The producers obviously strove for diversity when choosing who made the cut, which means New Kids on the Block get sandwiched between Wynton Marsalis and Sinead O’Connor in the 1990 recap. The ’98 show programs world/hip-hoppers Asian Dub Foundation next to the country pop of Shania Twain and Alanis Morissette often heated musings. And while the hours of documentary footage are never less than enlightening, how often are you going to watch them? Still, there are many inspired moments dotted across the discs such as Radiohead’s riveting 1998 set, Springsteen and Sting paring up for “The River” and almost everything by the always dependable Gabriel. If you are a fan of these acts, are looking to grab a previously missing piece of musical history, or simply want to support the worthy Amnesty International cause, this is something worth exploring more thoroughly. But for the casual listener, these artists have often done better live work elsewhere and sifting through hours of video to find the gems within, just may not be worth the effort.